The World Zionist Organization (Hebrew: הַהִסְתַּדְּרוּת הַצִּיּוֹנִית הָעוֹלָמִית; HaHistadrut HaTzionit Ha'Olamit), or WZO, is a non-governmental organization that promotes Zionism. It was founded as the Zionist Organization (ZO; 1897–1960) at the initiative of Theodor Herzl at the First World Zionist Congress, which took place in August 1897 in Basel, Switzerland. When it was founded, the goals of the Zionist movement were stated in a resolution that came of that Congress and came to be known as the Basel Program. Founded as the Zionist Organization (Hebrew: הַהִסְתַּדְּרוּת הַצִּיּוֹנִית; HaHistadrut HaTsionit), or ZO, in 1897 at the First Zionist Congress, held from August 29 to August 31 in Basel, Switzerland. The ZO's journal, Die Welt was founded in the same year. It changed its name to World Zionist Organization in January 1960. The ZO served as an umbrella organization for the Zionist movement, whose objective was the creation of a Jewish homeland in Canaan - at that time under the Ottoman Empire and following the First World War the British Mandate of Palestine. When the State of Israel was declared 51 years later on May 14, 1948, many of its new administrative institutions were already in place, having evolved during the regular Zionist Congresses of the previous decades. Some of these institutions remain to this day. Membership in the ZO was open to all Jews, and the right to vote for delegates to the congresses was secured by the purchase of the Zionist Shekel. Delegations from all around the world, and from many different political backgrounds and religious traditions, took part in each Congress; delegations/parties were mainly grouped by ideology, rather than by geography. In 1960 the ZO changed its name to the World Zionist Organization and adopted a new constitution under which individuals are ineligible for membership, which is reserved for organizations. Yaakov Hagoel, Vice Chairman, former Head of the Department for Activities in Israel & Countering Antisemitism. In 2009, the positions were separated again. Natan Sharansky was elected as the head of the Jewish Agency and Avraham Duvdevani was elected as the new Chairman of the WZO at the 36th Zionist Congress, on 15 June 2010. The finances of the WZO were conducted by the Jewish Colonial Trust (founded in 1899), and acquisition of land was conducted by the Jewish National Fund (founded in 1901).Keren Hayesod (founded 1920) funded Zionist and Yishuv activities prior to the creation of the state of Israel through enterprises such as the Palestine Electric Company, the Palestine Potash Company and the Anglo-Palestine Bank. The World Zionist Congress established by Theodor Herzl, is the supreme organ of the World Zionist Organization and its legislative authority. It elects the officers and decides on the policies of the WZO and the Jewish Agency. The first World Zionist Congress was held in Basel, Switzerland in 1897. The platform of the WZO is the Jerusalem Program. The Zionist Council, meeting in Jerusalem in June 2004, adopted this text as the latest version. Zionism, the national liberation movement of the Jewish people, brought about the establishment of the State of Israel, and views a Jewish, Zionist, democratic and secure State of Israel to be the expression of the common responsibility of the Jewish people for its continuity and future. Strengthening Israel as a Jewish, Zionist and democratic state and shaping it as an exemplary society with a unique moral and spiritual character, marked by mutual respect for the multi-faceted Jewish people, rooted in the vision of the prophets, striving for peace and contributing to the betterment of the world. Since 2004, Department for Zionist Activities of the World Zionist Organization bestows the Herzl Award annually upon outstanding young men and women in recognition of their exceptional volunteer efforts on behalf of Israel and the Zionist cause. A document brought before Israel's Supreme Court in 2009 showed that private Palestinian land was taken and given to Israeli settlers by the World Zionist Organization. The land in question had been ruled off-limits by Israel. The World Zionist Organization had been acting as an agent of the government in assigning land to Jewish settlers in the Israeli-occupied territories. The Israeli government, to avoid responsibilities under international law, used the World Zionist Organization to settle its citizens in the territory occupied in 1967. The document concerns several homes in the Israeli settlement of Ofra, approximately 15 miles north of Jerusalem in the West Bank. The Israeli Justice Ministry confirmed that the land in question was owned by Palestinians and that the nine houses in question had been ordered demolished. Dror Etkes of Yesh Din said "It's an international organization that is, simply put, stealing land." ^ Spencer C. Tucker, Priscilla Roberts, ed. (2008). The Encyclopedia Of The Arab Israeli Conflict: A Political, Social, And Military History. Santa Barbara, California: ABC-CLIO. p. 1095. ISBN 978-1851098422. Retrieved 2 February 2015. ^ See Chapter 2: The Seven Years of Herzl Archived 2010-01-25 at the Wayback Machine of Zionism – The First 120 Years Archived 2010-09-22 at the Wayback Machine by the Jewish Agency. ^ Reich, Bernard; Goldberg, David H. (2016-08-30). Historical Dictionary of Israel. Rowman & Littlefield. ISBN 9781442271852. ^ "ZIONISM- Timeline of Events". Mfa.gov.il. Retrieved 2008-11-29. ^ Marvine Howe (July 28, 1993). "Obituary:Dr. Simon Greenberg, 92, Rabbi And Conservative Jewish Leader". New York Times. Retrieved September 15, 2011. ^ "Chapter Two The Seven Years of Herzl". 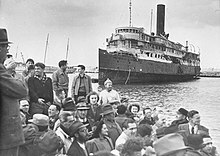 Jewishagency.org. Archived from the original on 2010-01-25. Retrieved 2008-11-29. ^ "Zionist Congress". World Zionist Organization. Retrieved 21 Feb 2015. ^ "Jerusalem Program 2004". Wzo.org.il. Archived from the original on July 7, 2007. Retrieved 2008-11-29. ^ "The Herzl Award 2004-2005". Wzo.org.il. Archived from the original on September 27, 2007. Retrieved 2008-11-29. ^ Teibel, Amy (21 June 2009). "Lawsuit brings murky West Bank land deals to light". Associated Press. Wikimedia Commons has media related to World Zionist Organization. The Central Zionist Archives in Jerusalem. Collections of the World Zionist Organization. This page was last edited on 2 February 2019, at 18:00 (UTC).